"A lady I worked with brought this in one day, and it was a hit. Now it is the favorite of all my dinner guests. It's great for a covered dish dinner too. I have made this also without the meat, and it is well received." Bring a large pot of lightly salted water to a boil. Add ziti pasta, and cook until al dente, about 8 minutes; drain. Preheat the oven to 350 degrees F (175 degrees C). Butter a 9x13 inch baking dish. Layer as follows: 1/2 of the ziti, Provolone cheese, sour cream, 1/2 sauce mixture, remaining ziti, mozzarella cheese and remaining sauce mixture. Top with grated Parmesan cheese. Bake for 30 minutes in the preheated oven, or until cheeses are melted. 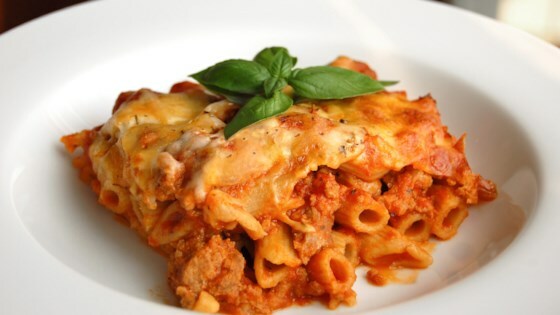 Here's a quick and easy baked ziti recipe, perfect for a weeknight dinner.